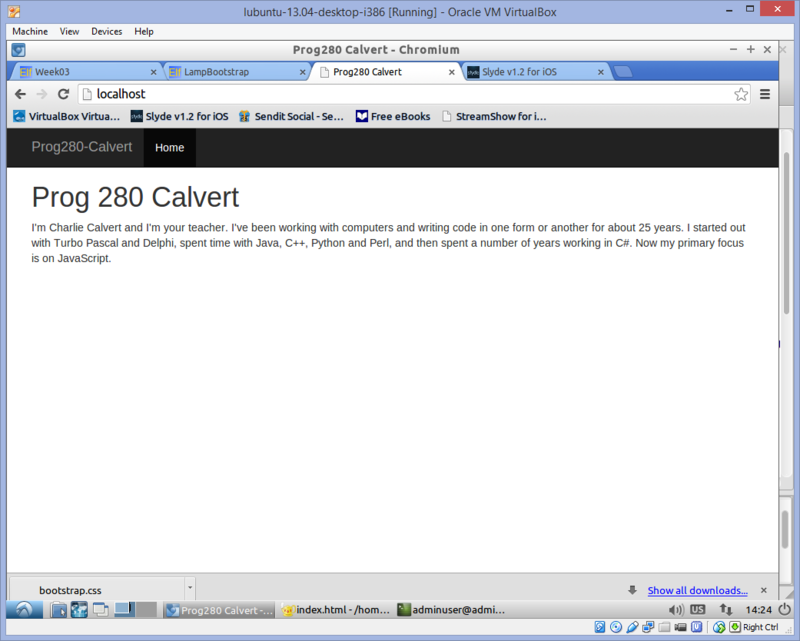 Set up the Apache Web Server and display a simple HTML file that uses bootstrap in it. 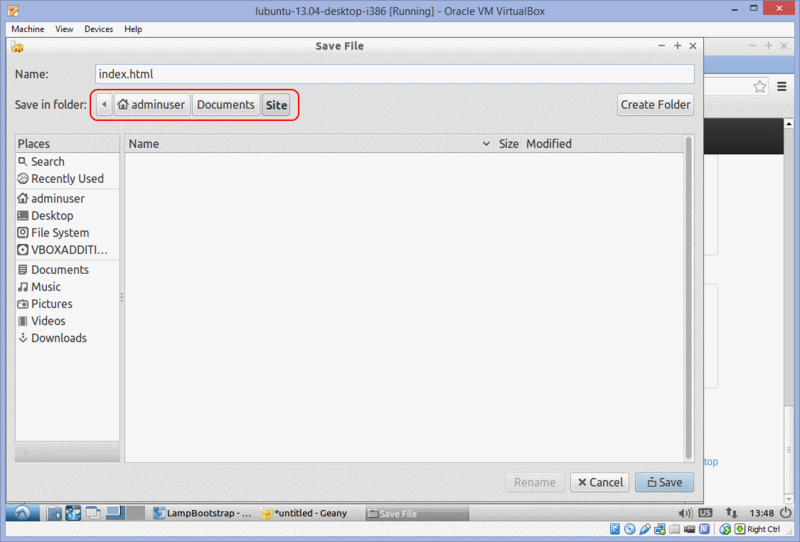 The goal of this assignment is to install LAMP on your copy of VirtualBox. Then replace the default index.html file with default page from Bootstrap site. Remove the default text on the page, and replace it with a paragraph of your own. Lamp is the primary platform of the web. It is an acronym for: Linux - Apache - MySQL - Python/Php/Perl. Both WordPress and MediaWiki depend on LAMP. Put the files in: /var/www, replacing the index.html that is there by default. NOTE: Not always, but usually, it is best to get code from JsObjects rather than from an assignment document. Of course, I often put code in an assignment that I don't put in JsObjects, but when I do put them in both places, it is usually best to prefer the copy in JsObjects. I'm more likely to update JsObjects than to update a document, and there is less chance of a typo (on my part or yours) causing a problem. We are now about to create some files on Lubuntu. The question of where to put the files is largely up to you. The most important thing is have a logical system. For now, however, I suggest that you place your files in your Documents folder in a subdirectory called Site. In the Lubuntu Start menu, you should have a new item entitled Programming. Geany will be available in that menu folder. 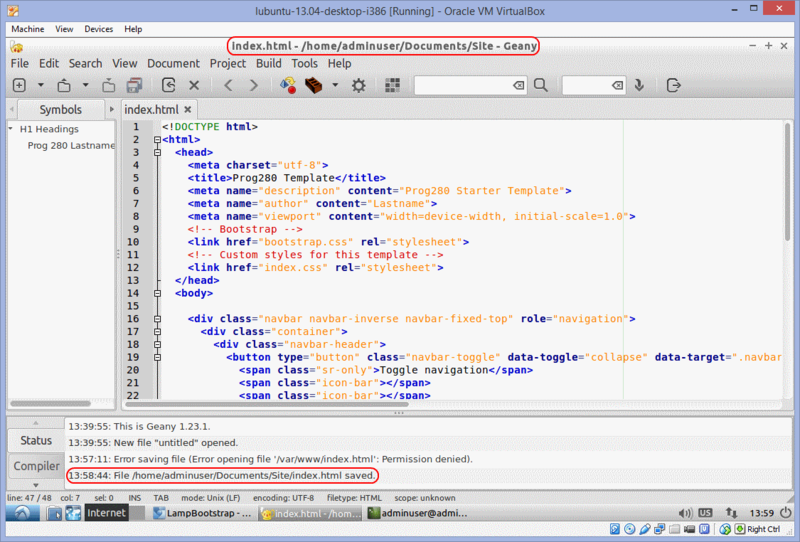 Open Geany, and paste the HTML for this assignment into the editor. Open the files we copied into Documents/Site in the editor. Here is what Geany should look like once index.html is successfully loaded from Documents/Site. (The details may differ a bit, depending on the name of your current user.) Edit index.html so it contains the proper content including your last name and the first paragraph from your introduction. Open index.css in Geany. Take a look at it, and see if you can understand what it does. Now you need to copy or link index.html, index.css into /var/www. The /var/www folder is where the Apache Web Server serves up HTML files. You will need to use both sudo and cp/ln to perform this operation. The quizes you took earlier are designed to help you perform these operations. 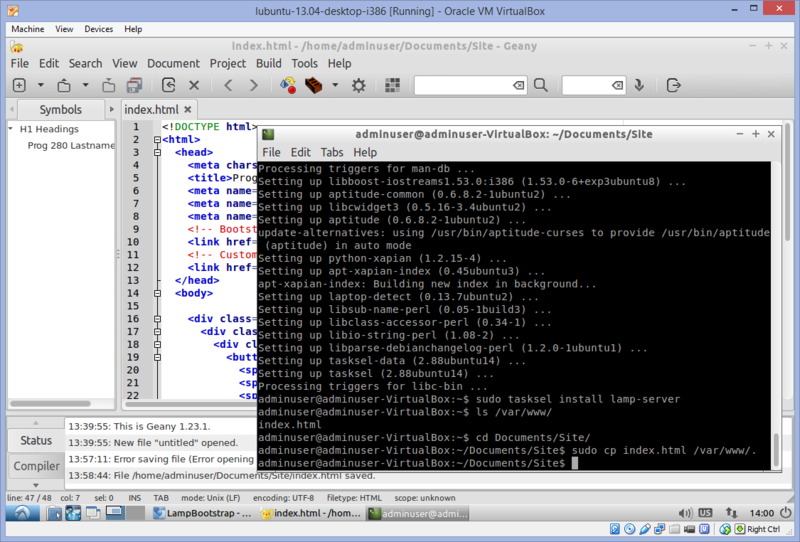 Use the Windows Snipping Tool or your preferred technique to take a screen shot of your copy of index.html running in VirtualBox and Lubuntu. The screen shot should look a lot like the image shown at the end of the last section, only it will have your lastname and a description from your introduction in the discussion section. Submit this screenshot to complete the assignment.